On the final day of 2011 Bicycle Stories becomes Kayak Stories as a I paddled -- not pedaled -- my vehicle on the Hillsborough River and enjoyed stunning views of the river and homes that I usually see from the road. My arms became my legs and I churned the serene waters of the Hillsborough River from the Lowry Park boat ramp to the dam on the river next to Rowlett Park -- some 2 1/2 hours of paddling amid a wonderful array of water birds, trees and views. What a cool bridge! I usually see it from the road on Park Circle in Seminole Heights -- now my vantage point is the Hillsborough River. Fans of Bicycle Stories may have seen photos of the famed Hanna's Circle section of the Hillsborough River from the shore, but now I'm smack in the middle of this wonderful bend in the river. There's Faye, saying hey on the river. We'll see Wes, Faye's hubby, on the way back. I'm heading to the train bridge next to Rowlett Park Drive. Yes, I made it to the dam. One of my favorite photos today. There's the wonderful Wes from the perch of his amazing back yard on Park Circle. Wes is with his granddaughter. I normally see this bridge while walking on Park Circle, but from the water I get a front=row look at this small bridge. Woot -- I'm in the middle of Hanna's Swirl. The water birds are amazing. This was one of my favorite houses because of the work beneath the main floor. Trees look so natural from the water. The old vacant Harbor Club looks sad. On the way back I saw the tower once more. Four ambitious women are undertaking a cross country endurance ride that will kick off in Key West on February 5, 2012 and culminate in San Francisco in late April. Two sisters, Jeanie and Chelsea Ward-Waller, their mother, Jane, and close friend Stephanie Palmer are riding across America to benefit the bicycle safety advocacy efforts of the League of American Bicyclists and the Safe Routes to School National Partnership. Dubbed "Ride America for Safe Routes" (RASR), their ride follows a route traversing 13 southern states and 20 major cities, logging over 5,000 miles between Florida and California. The mission of RASR is to raise $50,000 for the League’s Bike Friendly America program and for Safe Routes to School (SRTS) programs in local communities. In addition, the RASR Team will advocate the critical need for bike safety and promote the public health benefits of bicycling through events with local bicycle groups and SRTS programs in communities along their route. See the RASR website at http://rideforsaferoutes.blogspot.com or contact rideforsaferoutes@gmail.com for more information on the Ride and to support a future of bike-friendly communities. Come out and ride with the RASR riders in Tampa on February 12, 2012. Democrats and Republicans don't agree on much these days but when it comes to local, back yard issues, SWFBUD has been able to unite Democratic state legiuslator Janet Cruz and Republican state legislator Shawn Harrison behind a SWFBUD initiative -- building the BAM Network. 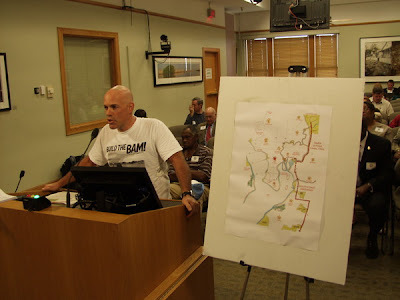 The BAM stands for "Bicycle Area Mobility" and it centers on SWFBUD's idea to get Tampa and Hillsborough County to partner on building a regional paved trail system that would unite the Tampa Bypass Canal Trail, the South Coast Greenway and the Selmon Greenway into one comprehensive highway system for bicyclists. The tri-trail BAM Network would interface with roads with bike lanes like Fletcher Avenue and also HART bus routes. Bicycling transcends politics. Which is why SWFBUD sat down with Rep. Harrison recently to garner his support for the BAM Network. Rep. Cruz has backed the idea of paving a trail along the Bypass Canal Trail and making it part of the bigger BAM Network. Rep. Harrison came up with the idea of co-writing a letter with Rep. Cruz supporting thr BAM Network and getting our local state legislators on both sides of the aisle in Tampa Bay to co-sign the letter that SWFBUD plans to share with Tampa Mayor Bob Buckhorn, the Tampa City Council members and the Hillsborough County Commissioners. Commissioner Mark Sharpe is already a big advocate of the BAM Network and wants to see it built. SWFBUD thanks Reps. Harrison and Cruz for stepping up and agreeing to co-write this BAM Network letter and for getting the local state legislator delegation to support SWFBUD's multi-trail system idea in Hillsborough County. The BAM consists of three trails that would make up more than 30 miles of paved trails to provide effective transportation and a safe haven for our many local bicyclists. The BAM can't be built fast enough as three more Tampa Bay bicyclists were killed by motorists in three days over the Christmas holiday weekend. 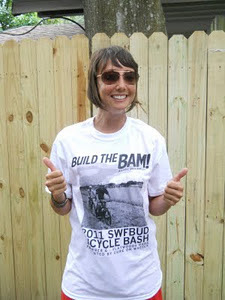 SWFBUD is already making strides with the BAM. SWFBUD has successfully lobbied the local MPO to conduct a feasibility study of the Tampa Bypass Canal Trail crossings, while the South Coast Greenway is in the MPO's 2035 Long Range Plan. The MPO has already had an open house for a consultant to preview the Selmon Greenway, too. SWFBUD is asking you to also support the construction of all three trails as a cohesive unit and network of paved trails in Hillsborough County and Tampa that would interface with local road bike lanes and HART routes. As you know, the Hillsborough/Tampa area has a high bicyclist fatality rate and bicyclists need safe places to ride their vehicles. Economic impact: A trio of bicycle paths in Orange County, Fla. pumps $42 million into the local economy annually and supports 516 jobs, according to a study conducted by the East Central Florida Regional Planning Council. Tourism: Trails promote Florida tourism. Health benefits: Bicycling is a great exercise that promotes wellness and fitness. Jobs creation: Studies show trail projects create more jobs per dollar than roads. Please write emails to your local elected officials asking them to support the BAM Network and attend public meetings to support the BAM. Let's turn Tampa and Hillsborough County around and go from worst to first in bicycle safety and bicyclist enjoyment. The Christmas weekend in Tampa Bay was a deadly one for bicyclists. A bicyclist was killed Friday, Saturday and Sunday -- three dead bicyclists in three days. Motorists killed bicyclists on both sides of the Bay. Friday in St. Petersburg: A motorist was charged with DUI manslaughter for the Friday hit-and-run death of a bicyclist in St. Petersburg. The driver of the motorized vehicle killed the bicyclist at 2:15 am. Read the Times story here. Saturday near Brandon: A Plant City bicyclist riding his bike across U.S. 301 just north of State Road 60 was killed by a pickup at 6:40 am Saturday near Brandon. Read the Trib story here. Sunday in Dover in Hillsborough County: A hit-and-run motorist killed a bicyclist on Sydney Dover Road at 6 pm Sunday. Read the Times story here. The stories are breaking news items with not too much information. But if you look at the times of the motorists striking and killing the bicyclists, you will see that there was little or no daylight -- Friday at 2:15 am, Saturday at 6:40 am and Sunday at 6 pm. This a reminder to light you and your bicycle up like a Christmas tree or a menorah so that you have the best chance to be seen by motorists when the daylight is dwindling or non-existent. In two of the three cases this weekend, the motorist struck and killed bicyclists and drove away. That gives you a little sense of the character of the motorists around here. In 2010, there were a dozen bicyclists killed by motorists in Hillsborough and with the two killed bicyclists in Hillsborough over the holiday weekend, the 2011 bicyclist death number hit eight. In 2011, the Pinellas County bicyclist death count hit 10 with the hit-and-run DUI manslaughter case in St. Petersburg. What happens when you combine a bicyclist who likes his helmet with a menorah=lighting ceremony? You get my new friend, who I met last night at the Hanukkuah event in downtown St. Petersburg. Are you a business in the USF area and want a bike rack? Contact the New North Transportation Alliance, which provides FREE “inverted U” bike racks to qualified New North Area businesses that agree to install the racks. The Alliance gave six "U" bike racks to the building that houses TBARTA at the USF Reaesrach Park. Here it is. Each rack holds two bikes and can accommodate many types of bike locks. Racks can be easily bolted into any concrete surface. Contact Julie Bond at bond@cutr.usf.edu. She can hook you up with the free bike racks. Nice job by the NNTA to offer free bike racks, which encourages bicycling. That's good for your business and the community. A Tampa First: A Share the Road Sign Appears On Bayshore Blvd. Dreams really come true in Tampa. Look what I saw this morning on Bayshore Blvd. A Share the Road sign. Whoa nellie! For years, SWFBUD has implored the city of Tampa to re-pave the city's signature road and include bike lanes from the Platt Street Bridge to Gandy. The road was not a pleasant experienced for bicyclists. The concrete sections gave bicyclists a "ka-thunp, ka-thump, ka-thump" rolling experience. A bike lane disappeared on the downtown-bound side of the road. And motorists still move too fast. But after years of SWFBUD lobbying, the city of Tampa government is adding bike lanes as part of an initial re-surfacing project from Rome Ave. to the Platt Street Bridge. And the Share the Road sign was added on Bayshore after Rome. Hope there are more Share the Road signs around Tampa. I was cycling across the Gandy Bridge this morning and gazed at the old Friendship Trailbridge, which was closed three years ago due to structural issues such as concrete pieces falling. The old Trailbridge was an amazing resource, offering incredible access to the body of water that ties our region together. I still cross the Bay on my bicycle, using the shoulder of the current Gandy Bridge. But the vast majority of users of the old Trailbridge don't bike the Gandy Bridge shoulders and I'm saddened this region's political leaders didn't see the value of restoring the Trailbridge. For years, I found it ironic that a regional Tampa Bay transportation agency called TBARTA never had a bike rack in front of its building. That's because I consider bicycling great transportation and just wish the people who work at regional transportation planning would join me in telling our elected leaders to fund bicycle transportation projects like regional paved trail systems and bike lanes that form a network. TBARTA is the same agency that at the start didn't show bicycles in its materials or slide shows and didn't have bicycles as part of a rendering showing downtown Tampa transportation center to a Bicycle Pedestrian Advisory Committee. I remember about three or four years ago Karen Kress, the super bicycle lady of the Tampa Downtown Partnership, spoke to the TBARTA board about an issue and ended her chat with a suggestion that the transportation agency have a bike rack in front of its building. For years, this agency located at the USF campus off Fowler Avenue never had a bike rack. Even my emails didn't spark TBARTA to have a bike rack. But I am a member of the Hillsborough/Tampa Bicycle Pedestrian Advisory Committee and a few months I made a motion that our BPAC Chair Jim Shirk send a BPAC letter to TBARTA asking for a bike rack. So just two days ago at our December BPAC meeting I saw a surprise -- a letter from TBARTA saying it has a bike rack. I stopped by the TBARTA building at the USF Connect building Thursday and didn't see a bike rack out front but there were these bike lock-up hoops behind the building. And because this is Tampa, you take what you can -- even if the bike lock-up area is behind the buulding and not in front. SWFBUD stores are always doing good deads. Take Chainwheel Drive in Clearwater and Palm Harbor, for example. Dottie Jessup tells me Chainwheel Driuve is involved in a holiday bicycle donation for kids and that on Wednesday, December 21, at 5:30 pm Jim Dodson Law and Chainwheel Drive will present the bikes to the kids who have been chosen to receive their first bikes. The presentation will take place at Chainwheel Drive in Clearwater. "We can't wait to see the kids faces when they come into our bike shop and see their bikes lined up all in a row with big red bows on each one," Dottie says. Well, that didn't take long -- the Florida Department of Transportation has removed a graphic and inflammatory video from its so-called pedestrian-bicyclist safety campaign web site created by the Troy Dunn advertisement company less than a month after the DOT issued a press release about the safety campaign. Months ago, SWFBUD warned the DOT that the Troy Dunn advertisement company's content was inflammatory and distorted because it blamed only pedestrians and bicyclists for getting hit and killed by motorists, but failed to hold motorists accountable for their actions. SWFBUD believes bicyclists MUST be educated about safely riding their vehicles on roads. But we also believe motorists must be held accountable, too -- something the local DOT safety staffers and the Troy Dunn advertisement company failed to accomplish in its safety campaign. The web site originally showed a highly graphic video on its home page that showed images collected off the internet of motorists smashing into pedestrians, with the pedestrians going flying. The scenes show pedestrians walking in front of cars and getting smashed, but I guess the Troy Dunn advertisement company couldn't find the videos of the two car drivers racing down Fletcher Avenue in Tampa and killing bicyclist Robert Niedbalec who was pedaling in a bike lane in February or the red-light-running driver who killed bicyclist Diane Vega at Spruce and Himes on Oct. 1, 2010. The DOT wanted something attention-grabbing in the campaign because, according to the DOT PR spokeswoman, the conventional Share the Road messages are too "vanilla." Apparently, the graphic video hatched by the Troy Dunn advertisement company was too inappopriate for the DOT. So, the web site shows another video on its home page showing elephants and tanks on a downtown street, scaring pedestrians and a bicyclist. SWFBUD also opposes that video because it reinforces the stereotype that roads are only for cars at a time when we are working to show the public that the roads are for everyone -- not just cars but for bicylists and pedestrians, too. In previous St. Pete Times stories on this DOT bicycle-ped campaign, Florida Bicycle Association Executive Director Tim Bustos expressed his concerns about this DOT campaign. Andy Clarke, executive director of the League of American Bicyclists, also opposes this inflammatory DOT-Dunn campaign that does little to instruct people on how we all as motorists, bicyclists and pedestrians can safely co-exist on local roads. The local DOT safety staffers in Tampa did not consult with the local Bicycle Pedestrian Advisory Committee or the Florida Bicycle Association about presenting safety content in this campaign. The local DOT safety staffers believe pedestrians and bicyclists cause their accidents and they're the ones who need to be addressed in a campaign. Without contacting the Florida Bicycle Association, the DOT-Dunn campaign stated this on its web site: "According to a published guide from the Florida Bicycle Association, bicyclists are at fault in seventy percent of all police-reported crashes because they violated traffic rules." FBA's Bustos said the DOT-Dunn web site distorted the information. SWFBUD, like most bicycle organizations, believes it's split about 50-50 between bicyclists and motorists regarding who causes accidents. The local DOT pays for a local agency to run pedestrian and bicyclist safety programs and SWFBUD supports that -- but how come there is no DOT initiative to also educate motorists on how they need to share the road with bicyclists and pedestrians? There are WalkWise and BikeSmart programs but what about a program to make motorists smarter or wiser about driving in a world where roads are for everyone? I spent today working with the Pedal America TV show crew, who are visiting Tampa Bay for a PBS episode on the local bicycling scene. They biked on the Pinellas Trail and Gulf Blvd in Pinellas Cointy and spent Saturday with the Seminole Heights Bicycle Club for an urban ride and a bicycle-theme art show. Pedal America is led by host Ira David, a wonderful friend I met 2 1/2 years ago at the National Bicycle Leaders Conference in 2009 in Monterrey, Calif. Ira David worked to draw the sponsors necessary to finance a series of eight shows on towns across the country from Napa Valley to Savannah to Chicago to central Pennsylvania. And this week he and his terrific can-do crew have been wonderful. Ira David's right-hand lady is producer Stephanie Rabiola, and his crew include camera whizes Peter and Andrew, super soundman Will and all-around tech Eric who went to the Lightning-Devils game tonight in Tampa. 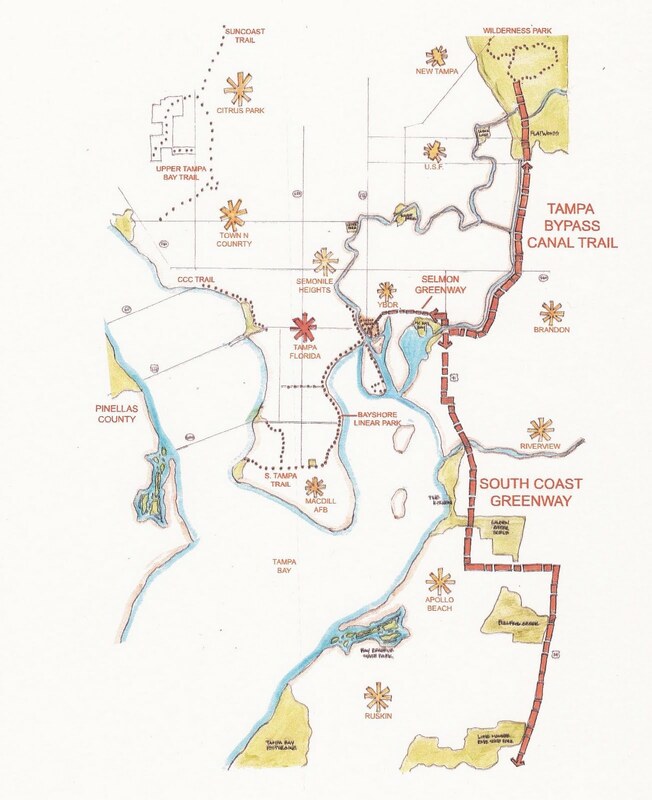 Tampa Bay is a diverse bicycle scene, and they hit the highlights such as the Pinellas Trail. The Pedal America crew put together the cool video camera that was on a tripod mounted on a trailer pulled by veteran cameraman Peter for shots along Riverwalk in downtown Tampa today. Putting together a TV show like Pedal America requires skill, enthusiasm, high technical standards and patience. My pal and show host Ira David and cameraman Peter showed all those qualities. There's camera guru Peter from Wyoming, who biked his video rig on a trailer. There's Ira David pedaling along Riverwalk in Tampa. He's a wonderful spirit who is using his TV show to show that bicycling is for all. My pal Ira David saw the disappearing bike lane on Cross Creek Blvd and wondered, "gee, this doesn't look right." The city of Tampa and Hillsborough County has blown off this pathetic example of bicycle infrastructure, but now it's going national on Ira David's Pedal America show. As Tampa bicycle man Jim Shirk put it, sometimes you have to shame local government into addressing bicycle concerns. Of all the wonderful scenes that played out today as the Seminole Heights Bicycle Club hosted a 12-mile bike ride to Hyde Park Village and back and a local bicycle art show as the Pedal America TV show came to film the SHBC, I recall one terrific anecdote. Our group of 35 diverse cyclists pedaling everything from road bikes to mountain bikes to fixed gears to tandems was heading south on Tampa Street a few miles north of downtown Tampa and a group of about a half-dozen young men were on the sidewalk. We rung our bikes bells and said hey and the guys reached out to give us high fives. And there it was for all to see. The essence of bicycling is about making connections -- with one's neighbors, local businesses and even people you never knew until they shared high fives with you on a bike ride. Pedal America, a new PBS TV show that will run a segment on the SHBC in May 2012, came along for our 12-mile ride to Hyde Park Village and back. And then we returned to Seminole Heights, we had a wonderful art show that exhibited paintings, photos and even furniture with a bicycle theme. I want to thank Rodney at Indigo Coffee who gave use free water at Hyde Park Village; Anthony and Elke at Reservations in Seminole Heights who donated a great big bowl of pasta salad; Veronica at The Independent who gave us a hummus dish; and the good folks at Publix who gave use a big box of granola bark packed with delicious raisens and nuts. Let's go for the ride today! Here's Tanja Vidovic, who rode with her daughter Kalina. Tanja did amazing paintings featuring bicyclist subjects for today's art show. There's Ira David Levy, host of Pedal America, chatting with Nanette before today's ride. Doug, the ride leader, addresses the crowd. Bicyclists gather for our ride. We're cycling south on Tampa Street passing through the MLK Blvd. intersection. There's Jared biking in the bike lane. We took the lane on Kennedy on the way to the University of Tampa because the lane was too narrow. Biking to Hyde Park Village. There's Rodney of Indigo Coffee. whoo gave us free water, with Pedal America's Ira David Levy and Stephanie. The wall of bicycle art and photos. Tanja talks with the Pedal America crew about her paintings. Bridget did a great job pulling the art show together at her cottage. Sitting at the cool bicycle table. Bridget dod a wonderful job arranging the art show. Here's a cool painting done by Tanja. Tanja did live bicycle art. Pedal America, the new PBS TV show on bicycling and community, came to Tampa Wednesday night and it was my pleasure to show the show's host -- my friend Ira David Levy -- to the places they want to film bicyclists such as along the Pinellas Trail and along Guld Blvd. Pedal America is also filming the Seminole Heights Bicycle Club on Saturday and I showed them the bike route we will be taking through downtown Tampa and to Hyde Park Village and back to Seminole Heights and also we stopped by The Cottage at 5801 Ninth Street where we are holding a bicycle art show from 11 am to 1 pm in Seminole Heights. We also stopped by Velo Champ bike store in Seminole Heights where Jordan Miller talked with Ira David, producer Stephanie and Peter about using camera equipment on a bicycle. Here's cameraman Andrew at the famed Hurricane restaurant on the Gulf of Mexico. Ira David's crew will be documenting the Hurricane. Ira David is also doing a segment on Ralph, who runs the Suncoast Seabird Sanctuary at Mile Marker 13 on Gulf Blvd.